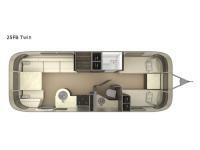 When you are ready for your next trip hook up this Airstream International Signature travel trailer and go! This model 25FB Twin features a front bedroom space with twin beds that have a nightstand in between and a LED TV for your enjoyment at night. In the complete kitchen, there is a 7 cu. ft. refrigerator for you to keep all your perishables. There is a split bath with a private toilet area including a sink on your right, and across the hall you will find a nice size shower. You can also pull the two curtains across the trailer if you need the full bath all to yourself. The lounge sofa can be used for seating during the day and at night transform into an extra sleeping space.